Nightmares are unpleasant dreams with particularly vivid and disturbing content, usually accompanied by a strong negative emotional response (e.g. fear, horror, despair, anxiety, sadness, etc). Sufferers may wake from nightmares in some distress, usually with a good recall of the dream’s content, and they may be unable to get back to sleep for some time. Although by some estimates at least 40%, and perhaps as much as 75%, of normal dream content is actually negative in nature, a nightmare bad enough to wake someone up in the middle of a sleep cycle usually only occurs about once a month on average. Nightmares are more common in younger children and teenagers, but one out of every two adults also has nightmares on occasion, and an estimated 2-8% of the adult population is plagued by nightmares on a regular basis. Women are more likely than men to suffer from regular nightmares. According to some studies, night owls (who naturally go to sleep later and wake up later) are significantly more prone to nightmares, possibly due to the build up of cortisol in the early morning in preparation for awakening. Among the more common themes of nightmares are: feeling lost or trapped; falling or drowning; malfunctions of phones, computers or other machinery; trouble with a car or other vehicle; being naked or inappropriately dressed in public; natural or man-made disasters; failing or being unprepared for a test or exam; loss of or damage to a house or property; suffering an injury, illness or death; being chased or attacked; etc. Like dreams in general, nightmares are often quite bizarre and surreal, even though they may feel perfectly realistic and logical to the dreamer at the time. Many people believe that dreams, and nightmares in particular, are symbolic and are not to be taken at face value or interpreted literally. Rather, nightmares indicate that the subconscious is trying to convey important issues to the conscious mind, and to reflect one’s inner feelings towards a particular problem or predicament in waking life. 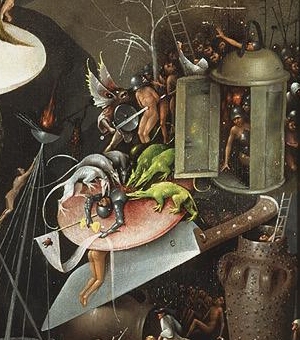 However, there are many different schools of thought on the meaning and interpretation of dreams and nightmares (see the section on The Meaning of Dreams), and many scientists today are of the opinion that there may be little or no specific meaning to them. Recurrent nightmares, often generated by stress or unresolved emotional issues, and particularly prevalent in women, may cause multiple awakenings during the night, leading to sleep deprivation symptoms and interfering with long-term sleep patterns. Recurrent nightmares are sometimes considered a fully-fledged parasomnia, occasionally even requiring medical intervention. In addition to psychological causes (e.g. stress, anxiety, emotional problems, post-traumatic stress), nightmares may have physical causes (e.g. sleeping in an uncomfortable or awkward position, eating just before sleep, fever or other illness) or even chemical causes (e.g. the ingestion of opioids, narcotics, antidepressants, etc). Sleep deprivation is often another contributing factor, as are some specific sleep disorders like sleep apnea and restless legs syndrome. But sometimes nightmares appear to occur spontaneously, for no obvious reason. Neurologically, it is thought that nightmares are just dysfunctions of the normal dream process during REM sleep – see the section on How Sleep Works. These dysfunctions may be due to neurotransmitter imbalances, or possibly to abnormal activity in the limbic system (the part of the brain that deals with emotions). There is a known genetic element in more chronic cases, and there is a 45-50% likelihood that identical twins will share a propensity to nightmares, as compared to about 20% for non-identical twins. Incidentally, there is no evidence for the conventional wisdom that eating cheese at night causes nightmares. While a heavy meal late at night is likely to cause disrupted sleep in general, dairy products also contain tryptophan which can actually aid in a good night’s sleep. However, neither case has specific implications for the occurrence of nightmares. As another aside, the Anglo-Saxon root of the word “nightmare” actually used to mean a suffocating evil spirit that visited at night. The word, then, seems to have originally referred to the parasomnia we now call sleep paralysis (see the separate section on Parasomnias), and it only came to be used to mean a bad dream as recently as the 19th Century. Night terrors (or sleep terrors), while superficially just an extreme kind of nightmare, are actually a very different phenomenon, both biologically and psychologically, and are considered a type of sleep disorder or parasomnia. 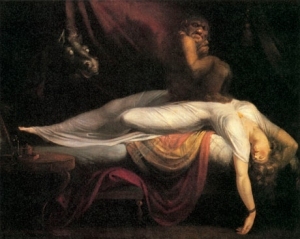 Night terrors typically occur during deep slow wave sleep, rather than during REM sleep, and reach an intensity even a bad nightmare cannot match. They usually begin around the age of three to six, and generally disappear during adolescence. Sufferers often sit bolt upright, screaming, crying, babbling incoherently and gesturing frantically, and they may be confused and completely inconsolable for quite some time after waking. They are often sweating profusely and their heart rate and blood pressure are usually significantly elevated. As a rule, they are unable to recall any details of any dream imagery, and in the morning they may not even be aware of having awoken at all.